Remarkable first editon of Jaillot's important map of America showing California as an Island. Amerique septentrionale divisee en ses principales parties, ou sont distingues les vns des autres les estats suivant qu'ils appartiennent presentemet aux Francois, Castillans, Anglois, Suedois, Danois, Hollandois, tiree des relations de toutes ces nations par le S. Sanson, geographe ordinaire du roy. 1674. An impressive and scarce 1674 map of North America issued by Alexis-Hubert Jaillot on a massive scale and offered here in its first edition. The map covers all of North America and Central America from Baffin Bay to the Spanish Main. The map extends westward to past an Insular California to include Terre de Iesso (a speculative mapping of Hokkaido) and eastwards past the Azores to include the British Isles. Jaillot derived this expanded format map from the earlier work of Nicholas Sanson, a figure who revolutionized French cartography. We can trace the fundamental design of this map to two Sanson maps. 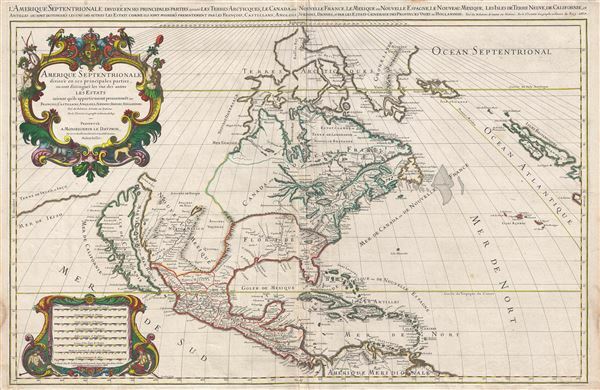 First, his 1666 map of North America - on which most of the basic cartography is based. Second, Sanson's 1657 map of California, from which both maps derive their model of Insular California - itself derived from maps associated with the English explorer Luke Foxe's expedition in search of the Northwest Passage. Thus the form of California seen here follows the Second Sanson model or, more properly, the Luke Foxe model. It was Foxe who is credited with introducing the curious form of northern Insular California, including the Bay of Talago, the Rio de Estiete, and the unusual peninsula extending from the mainland, Agubela de Gato. The origin of this cartography beyond Foxe remains a mystery. Adopted by Sanson in 1657, this form became standard convention for the representation of Insular California until the early 18th century. In addition to its remarkable presentation of California, this map also offers a very ephemeral perspective on the Great Lakes. While all five lakes are present, Lake Superior and Lake Michigan (Lac des Puans) are open at their westernmost extremes, thus illustrating the primitive sate of exploration in the region as well as the high hopes of European monarchs that one of these lakes may provide a passage to the Pacific and the lucrative markets of Asia. Like Huron is identified according to its original Huron-Petun (Wyandot) name, Karegnondi (tr. 'Big Lake'). The Mississippi River, here identified a Chucagua, a term derived from the journals of the De Soto expedition, is relocated well to the East - a major advancement over previous maps. Jaillot's reasoning behind this relocation is unclear but may have been influenced by reconnaissance associated with the recently returned expedition of Jacques Marquette and Louis Jolliet. In Spanish Florida, which extends north to include most of the American Southeast, Lake Apalache or the 'Great Freshwater Lake of the American Southeast' is noted. This lake, first mapped by De Bry and Le Moyne in the mid-16th century, is a mis-mapping of Florida's Lake George. While De Bry correctly mapped the lake as part of the River May or St. John's River, subsequent navigators and cartographers in Europe erroneously associated it with the Savannah River, which instead of Flowing south from the Atlantic (Like the May), flowed almost directly from the Northwest. Lake Apalache was subsequently relocated somewhere in Carolina or Georgia, where Jaillot maps it and where it would remain for several hundred years. This map is identifiable as the first edition / first state because of (a) the date in the margin title, (b) the term 'milles' as the first word in the scale, and (c) the fact that none of the meridian lines run through the word 'Apache Vaqueros.' Burdon suggests that it was most certainly issued independently as early as 1674, but that it was not published in Jaillot's spectacular L'Atlas Nouveau until that publication was finally issued in 1681. While all examples of this map are rare, and often in poor condition because of its immense size, it is notable that this is the first edition and as such almost impossible to find. Very good. Minor centerfold wear. Else very clean. Platemark visible. Blank on verso.